What does the Dallas Morning News Think About the Mazda MX-5 RF? 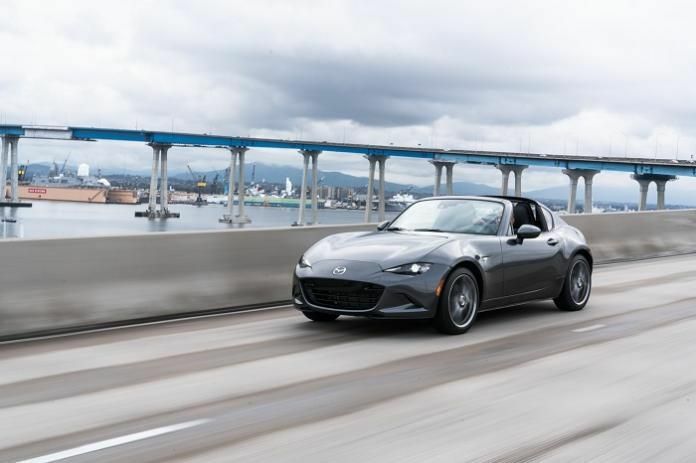 Dallas is the kind of place that offers a fair amount of weather conducive to top-down motoring, so what does the local paper think of the Mazda Miata MX-5 RF? It’s hard to tell exactly if the review applies directly to Metroplex locals, as it was written by New York Times scribe Tom Voelk and picked up via wire service, but we can at least pick Voelk’s brain for this thoughts on the RF. The headline says that the car offers drivers a convertible without the hassle of a soft top, so that’s a start right there. Voelk remarks that the RF provides a great advantage over the soft top right off the bat – it’s harder to break into a hardtop car. He also notes that the RF is quieter than the soft top with the top up. Another point of praise: The show that goes on when the top is dropped. “The top also gives everyone within 50 feet a ballet performance as the buttresses rise rearward and the roof panel pirouettes back behind the two seats,” Voelk wrote. It’s not all roses, however. Like others who have reviewed the RF have noted, even with the top down, the RF doesn’t fully open to the air the way that soft top models do. Previous-generation hardtops also were more open to the sky. He also complained about wind noise above 40 mph, and his hair being tousled about. He also points out that the car is a “relative” bargain compared to competitors like the BMW Z4. Overall, his review is in line with what we’ve read about the RF, and what we’ve experienced behind the wheel of the soft-top version. The positives – the car is well-balanced, a true driver’s car, unbelievably fun, the hardtop makes the car more livable in bad weather and makes the car less susceptible to break-ins. The negatives – the RF causes too much wind buffeting and top-down noise, it mars the styling, and it makes occupants feel claustrophobic. The Miata will never be for everyone, but giving it a retractable roof makes it available for a larger potential buyer base. Mazda will live with the downsides of the RF in order to sell more cars, and we suspect that RF owners will, too.